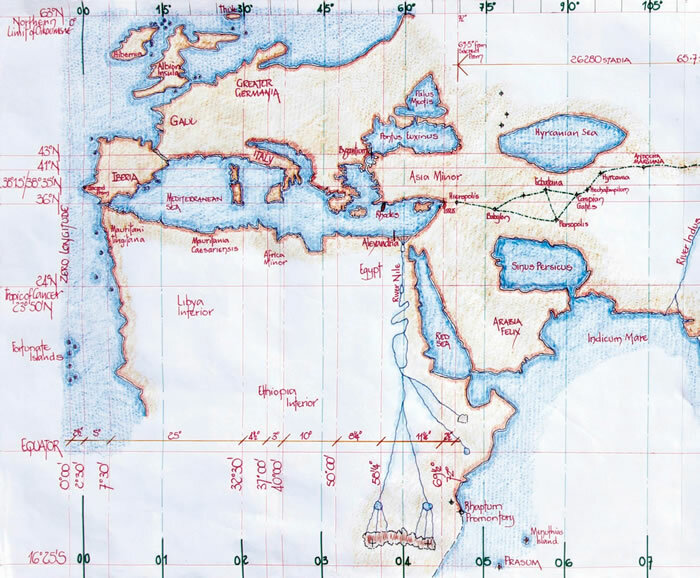 The map of Marinus the Tyrian is in fact the map used by Claudius Ptolemy but drawn on a different graticule. A simple investigation of the text of Claudius Ptolemy reveals that fact. Also indicated, despite the protestations by Ptolemy concerning the length of the oikoumene given by Marinus, is the fact that Ptolemy actually uses the same length, although he tries to hide the fact, to determine his oikoumene of only 180 degrees. But Ptolemy in describing the earth from those commentaries interjects his own beliefs and although he infers there are at least three volumes of the Geography by Marinus the Tyrian, he does not explain them. Ptolemy also commits a form of plagiarism in that he infers he has updated the work of Marinus, when in fact it can be shown he has just copied it all. By analysing the text of Ptolemy, both written and tabular we can establish the supposed variations. Volume 1: A collection of itineraries both by land and sea, with timescales and or stadia lengths included. This would have been raw data which required to be analysed for geographical distances. It would also have contained information from preceding geographers. Volume 2: The correction of the above data into distances upon the geographical world, based upon the latitudinal degree which we are told contained 500 Stadia of indeterminate length. Volume 3: The Heavens, The Zodiac, Fixed Stars and their locations when observed from the earth. This is probably the work of Hipparchus. It would also have contained the star sights of Marinus which were no doubt used to confirm latitudes. There was then the map or maps. Ptolemy states that there were many copies of the Geography of Marinus, which indicates a continual updating. He also states that through scribal error there are many mistakes, but he does not indicate what they may have been or if they affected the maps or how many maps there were. “First of all, Marinus places THULE as the terminus of latitude on the parallel that cuts the most northern part of the known world. And this parallel, he shows as clearly as is possible, at a distance of 63 degrees from the equator, of which degrees a meridian circle contains 360 degrees. Now the latitude he notes as measuring 31500 stadia, since every degree, it is accepted, has 500 stadia. Thus we can calculate that the southern terminus was the Tropic of Capricorn, 23050’ south. We can also note that it is Marinus who determines the 63N latitude with its geographical consequences. CHAPTER 8: THEY ARE ALSO CORRECTED BY MEASURING JOURNEYS ON LAND. The whole of the first paragraph of chapter 8 is actually unnecessary. Firstly by the statements in chapter 7, but actually unless he is working from one text or Book and then moving to a second text or Book he totally mis-understands the data. That would occur if in dictating the first text and deciding that Marinus was wrong, Ptolemy decided to illustrate the fact and then discovered that Marinus in the second book had made all necessary adjustments. It also begs the question, did Ptolemy make full use of the second book of Marinus? CHAPTER 9: THEY ARE ALSO CORRECTED BY MEASURING JOURNEYS BY WATER. It is unhelpful to our researches that Ptolemy did not explain the number of days travel allotted by Marinus. Future calculations from the distance measures given would have been easier. CHAPTER 10: ETHIOPIA SHOULD NOT BEPLACED MORE TO THE SOUTH THAN THE PARALLEL WHICH IS OPPOSITE THE PARALLEL PASSING THROUGH MEROE. But, who determined the parallel of Meroe? CHAPTER 11: THE ERRORS OF MARINUS IN CALCULATING THE LONGITUDE OF THE HABITABLE EARTH. Ptolemy considers this distance too great and reduces it,” and that it be reduced, as it ought to be, it will be seen to include not quite the space of 12 hours, that is by locating the Fortunate Islands at the extreme west and placing at the extreme east the SERES, Sina and Cattigara”. This is not a scientific appraisal of longitude but a belief, an assertion without proof. That the distance is perhaps too long should have been evaluated from acceptable data and not arbitrarily altered. Ptolemy has 180 degrees at 00N, i.e. 180 x 500 = 90000 stadia. Thus the arbitrary figure possibly had a semblance of reason, or was chosen for simplicity. Ptolemy then states he will shorten these distances to make the necessary adjustment to account for deviations from a measurement along a parallel, which is the route distance of Marinus. Thus we have the beginnings of the length of the oikoumene of Marinus the Tyrian. 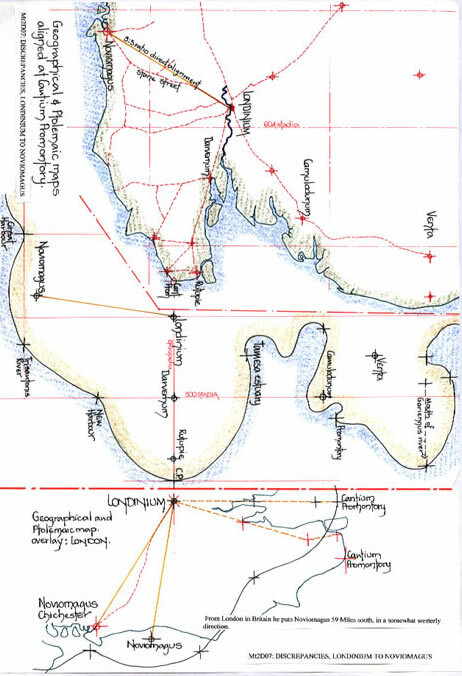 CHAPTER 12: THE CALCULATION OF LONGITUDE CORRECTED BY LAND JOURNEYS. Ptolemy reduces the distance from the Stone Tower to Sera, viz., 36200 stadia by one half to 18100 stadia or 45 and one fourth degrees. But, he only reduces the distance from the Euphrates to the Stone Tower by 76 Schena, to 800 Schena or 24000 stadia, stating that this particular measurement has been verified. He then proceeds to describe the route as is discussed in my text Mt1. Ptolemy’s text is followed by a summation of the longitudinal measure or length of the oikoumene using the measurements of Marinus with the two adjustments discussed previously in this chapter. By adding together the distances given by Marinus upon the 36th parallel we can establish the difference between the two measures. Marinus has, 720 + 26280 stadia + 36200 stadia, which is 72 + 65.7+ 90.5, totalling 228.2 degrees. This figure is never mentioned by Ptolemy, nor does he explain the difference quoted with the 225 degrees or 15 hours of Marinus. Ptolemy knew of the 90.5 degrees because he halves it at 45 ¼0. The distances of Marinus are as follows; Cory to Curula 3400 stadia northwards; Curula to Palura 9450 stadia with the winter rising sun; THE SHORE OF THE GANGETIC BAY HE PLACES AT A FURTHER DISTANCE OF 19000 STADIA; from Palura to the city of Sada is 13000 stadia to the equatorial rising sun; Sada to Tamala is 3500 stadia and Tamala to the Golden Chersonesus is 1600 stadia both to the winter rising of the sun. Ptolemy completely revises the above distances, but it should be noted that these only reflect the eastern coastline of India. The western coastline is not mentioned at all. My text Cp3, India Intra Gangem, fully discusses the data provided by Marinus and indicates that it is based upon the measurements provided by Strabo, but attributed to Eratosthenes. Thus the 19000 stadia mentioned above is a misnomer and one of those original Eratosthian distances. CHAPTER 14: CONCERNING THE VOYAGE FROM THE GOLDEN CHERSONESUS TO CATTIGARA. “Marinus does not tell the number of stadia from the Golden Chersonesus to Cattigara”. There is then a comparative measurement discussion apropos Africa/Libya and Ptolemy by a certain manipulation of the numbers arrives at a distance of 340 45’ from Cory to the Golden Chersonesus and then from Cory to Cattigara is given as 52 degrees. The above text is an amalgam of the work by Marinus and Ptolemy. The explanation which follows this investigation of the original text and the diagrams I have drawn fully illustrate the machinations of Ptolemy. CHAPTER 15: CONCERNING DISCREPANCIES IN SOME OF THE EXPLANATIONS OF MARINUS. This chapter is fully covered later in terms of the text and an analysis of the supposed discrepancies of Marinus, which as the diagrams and explanation show these supposed discrepancies are continued by Ptolemy despite his protestations. He comments at length regarding the Mediterranean Sea and opposing Cities, giving examples which he himself actually perpetrates in his Geography. Thus we can basically establish that the positioning of places by Marinus, in many instances geographically reasonable and in other instances far better than the altered position determined by Ptolemy. However, Ptolemy has used the whole text and map(s) of Marinus for his Geography, he states that quite openly and thus it would appear he has forgotten these stated errors by the time he reads from the map the latitudes and longitudes which he has tabulated. CHAPTER 16: IN FIXING THE BOUNDARIES OF PROVINCES MARINUS HAS MADE SOME MISTAKES. This very short chapter provides for no new material. From that text it will be readily understood that there is a confusion regarding the place-names for what we now know as China. That confusion is further exacerbated later in the text of Ptolemy. The chapter then has a resume of the Periplus of the Erythraean Sea. CHAPTER 18: THE INCONVENIENCE OF THE METHOD OF MARINUS FOR DELINEATING THE HABITABLE EARTH. Thus we may infer from this text that Ptolemy had access to several copies of the text and maps by Marinus, and that Marinus sought to continually update the text and maps he was producing. That text infers Marinus and Ptolemy were far enough apart in historical timescale to allow for History to be rewritten and new information to become available. That however is a major point of conjecture which I cannot comment upon. But, if Marinus lived in the 1st century CE and Ptolemy who we believe lived around 100 to 170 CE, (but was working in Alexandria in 150 to 170 CE,) there is the possibility they are perhaps as far as 100 years apart in their working lives. But, what are the “later series of more accurate maps” which were available to Ptolemy and thus of the second century CE. Unless we have our dates totally wrong, Marinus should have been fully aware of the writings of Strabo and thus of the Geography of Eratosthenes. That fact is borne out by the usage of the Eratosthian Stadion by Marinus in his description of India, as my texts Es1, Es2 and Cp3 note. Thus, we can only assume it is the work of a Geographer such as Pomponius Mela who lived in the 1st century CE and was perhaps a contemporary of Marinus. Perhaps this is a non sequitur, a wishful requirement by Ptolemy? However there does not appear to be any other geographer that we are aware of. It is only here that we read of the methodology of Marinus in constructing his map or maps. 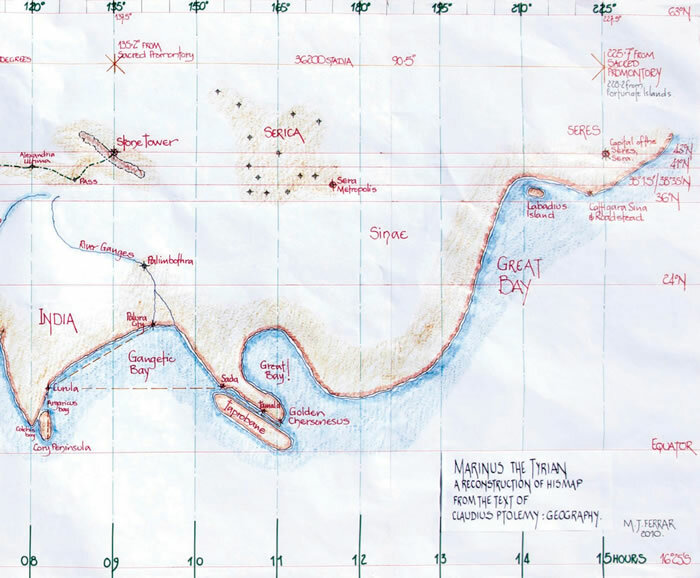 Thus we clearly know that the map of Marinus was drawn with a latitudinal scale of 500 stadia and a longitudinal scale of 400 stadia, and we can evaluate the map distortions which would have occurred. But, unless the map was of sufficient size, i.e. something in the order of the Ebstorf Mappa Mundi, 3 metres per side, any difference between the scales would have been so small as to hardly have been noticed. The major distortion would have occurred at the 63rd parallel when the 400 stadia should have been 227 stadia. But this is only the same distortion as on a Mercator projection map. At c240 N, the Tropic of Cancer, the measure is 457 stadia, and as such 91% of the actuality. There is also the descriptive text to evaluate. It was common in ancient times to use” towards the rising sun”, “towards the setting sun”, etc., and to qualify them with a seasonal time. We can only assume that such descriptions relate to the Mediterranean Sea and Alexandria in particular which is at 31N. It has been suggested that solar bearings were taken from Rhodes. If so the difference is marginal. Thus we have a definitive set of angular bearings for comparative research within the text. Mt2D03 sets out the suns path across the sphere of the earth and thus the sunrise and sunset bearings for any period of the year based upon 31N, Alexandria. 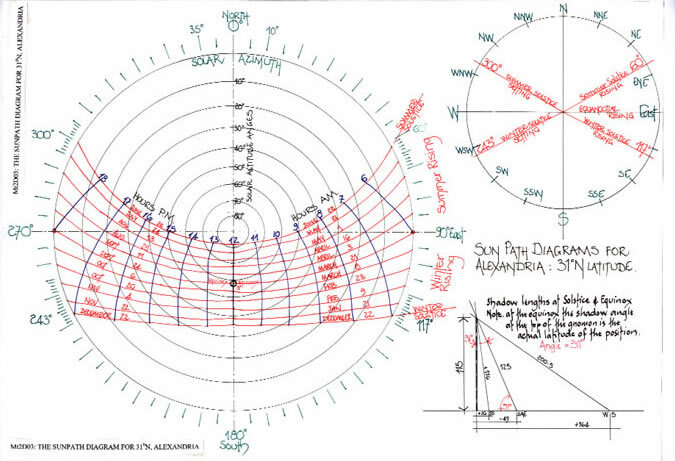 It should also be noted that at the Equinox, spring and autumn, the angle subtended at the top of a gnomon by the sun shadow at midday will always be the actual latitude of the gnomons position. Thus we have basic data with which to analyse the text of Marinus/Ptolemy. The 1st century CE is the Roman world and the time of the Julian/Claudian dynasty until 68 CE and then the Flavian dynasty 69-96 CE. This was followed by 96/98 M Cocceius Nerva; 98-117 Trajan and 117-138, Hadrian. In this period the Roman Empire expanded to include Armenia, Assyria, Mesopotamia and Dacia. There was history to be written and the ever expanding trade routes to consider. From the beginning of the Imperial Period of Rome, an extension of the long distance trade routes, which included, Ireland, Scotland, Germania, North and South Eastern Europe was very noticeable. Roman Africa was connected with central and west Africa, Egypt to eastern Africa and Ethiopia. Caravans brought long distance trade to and from the Orient. Southern India, China, Siberia and Ceylon (aka Taprobana) were in the forefront of the mainly exotic goods. Long distance travel was no longer the prerogative of peoples belonging to a particular trade. Now there was a hierarchy of specific attributes as opposed to trades. We now find non-specialised long distance traders (pragmathentes) who were assisted by Offices, Book-keepers and Agents. And thus records were kept, journey times established and the beginning of data which can be used by historians collated. Originally it was no doubt to ensure that the principal of a trading organisation was not cheated on the journey. But importantly it is evident that information regarding the routes and timescales was transmitted to the Library at Alexandria and its very inquisitive Librarians. When we read of the trade routes known to Marinus, as text Mt1 illustrates, it is hard to understand why it could be thought that there was much significant information he was not aware of given the investigation he undertook. Thus we may consider that the comments of Ptolemy are made in the light of the fact he is editing the Geography of Marinus the Tyrian and not writing his own Geography and, that he required to show there was information only he was privy to, however little it may have been. 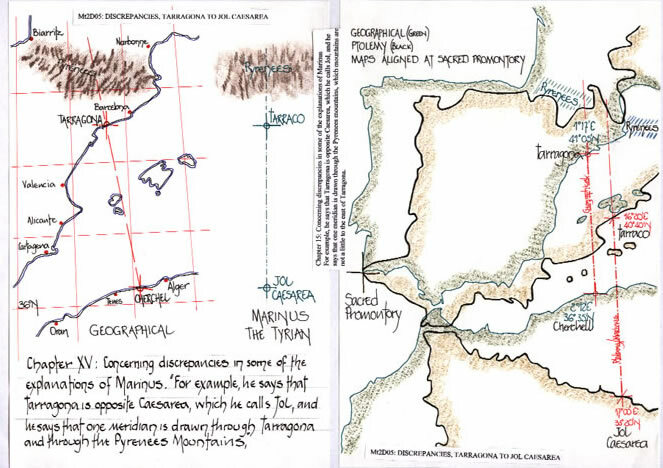 To establish the data relevant to the map or maps of Marinus it is necessary to move between chapters for continuity. It will be obvious to all that the continuity of the text written by Ptolemy is somewhat compromised by the extra-ordinary placement of data given the chapter headings. In fact if the Zamoyski Codex (National Library of Poland), a possible fourth edition of the Geography of Claudius Ptolemy is studied, it will be found that the chapters are re-arranged and in fact edited for content. The whole text is therein, but the order is somewhat re- arranged possibly to ensure a form of continuity. Claudius Ptolemy clearly states that he accepts the measurements of Marinus for the Mediterranean Sea, i.e. 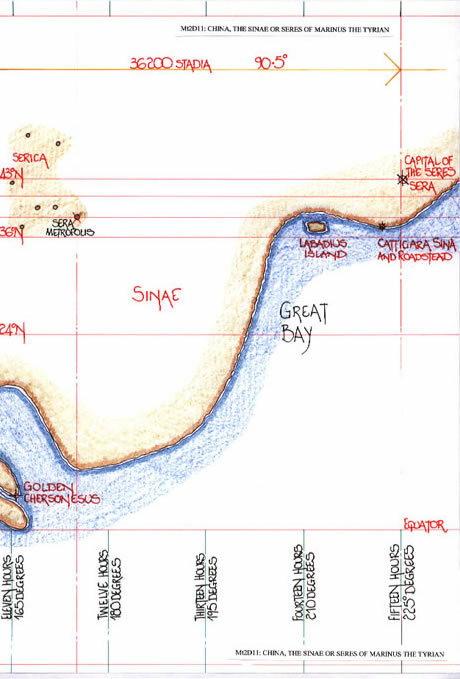 from the Sacred Promontory at 2 ½0 east to the Euphrates at 720 east, a spread of 69 ½0. As text Cp2 has already shown the 62 ½ degrees from Calpe to Issus equates to 25080 stadia which is in fact the geographical distance equivalent measured at the equator, the favourite of Ptolemy. Thus geographically from Calpe, 5022’ west to Issus at 360 10’ east is actually 410 32’ and a distance of 25086 stadia. But in accepting the Marinus calculation, Ptolemy is also accepting the Map of Marinus, as the one is derived from the other. Was it therefore Marinus who determined the overall latitudes, as it appears from the 630N position of Thule in the texts? Ptolemy in the Almagest discusses land further north in Scythia. Was it therefore Marinus who determined the shape of Britannia, and thus the mis-shape that was made to fit predetermined latitudes? Ptolemy comments that he accepts all of the work of Marinus for the Mediterranean Sea, but Britannia, Gaul and Greater Germania cannot be distinguished from the littorals of the Mediterranean Sea. They are part of the whole system. Thus was Ptolemy only required to read from the map or maps of Marinus to ascertain the latitudes and longitudes of each individual site and then re-position them on a map framework or graticule which agreed to his theory and corrected the over and under scales of the Marinus graticule based upon the 36th parallel? As indicated above Ptolemy in his “Almagest”, for the northern extremity of his oikoumene, stated that the parallel 64 1/20 north of the equator passed through the “Lands of the unknown Skythians”, and that Thule was at 630N. This does not appear in his comments or on his maps. When chapters 6 to 20 are analysed, Ptolemy does not reduce any longitudinal measure before he considers India after the river Indus, or India Intra Gangem. Does he therefore accept the whole of the text by Marinus until the limit of the Indus River? Ptolemy is very cautious in stating the acceptance of any measure that is east of this point. However, he then extends his approbation to the location of Cory Island and the 125th meridian, by not complaining about the western littoral of India and stating that the source of the Indus River and Taprobane are slightly to the east of the 125th meridian. Thus we may assume that any point noted to the west of the 125th meridian which is not commented upon is accepted. The only noted adjustment which would affect any map up to the 125th meridian is in Africa and concerns its southern extent. The map of India Intra Gangem that would have been produced from the data given by Marinus is considerably adjusted by Ptolemy from the promontory of Cory to the Ganges Delta. However Ptolemy appears to accept the location of that delta. 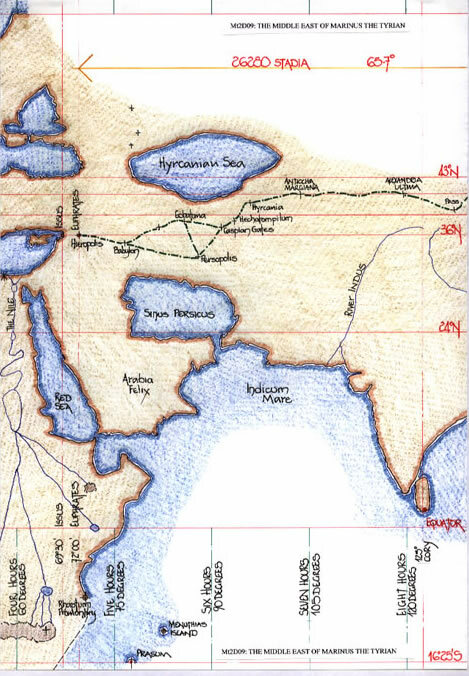 Marinus describes the east coast of India and then to the Golden Chersonesus by distance measure and solar direction. Ptolemy recalculates these distances which on the face of it have no factual basis. Thus Ptolemy produces a form for India I have described in text Cp3 as “sinuous as a snake”, and with no geographical basis. In fact text Cp3 indicates that both Marinus and therefore Ptolemy have used the description of India given by Strabo as attributable to Eratosthenes. That fact also includes the use of the Eratosthian Stadion of 157.5 metres. Thus the geographical distances, 68E to 92E or 24 degrees/13250 stadia of c184 metres is extended to 16000 stadia of 157.5 metres. Calculated we have, 16000 x 157.5 = 13700 x 184, and thus a considerable error of longitude was introduced to northern Asia. Marinus states the distance from Hieropolis to the Stone Tower as 26280 stadia, 876 Schena, but Ptolemy reduces this to 24000 stadia, 800 Schena, i.e. 90% of the distance in question and hardly an adjustment when compared to the 50% adjustments made elsewhere. But, Marinus places the Stone Tower 26280 stadia or 65.7 degrees east of Hieropolis and thus a total longitude of 137.7 degrees or 9 hours from the Sacred Promontory of Iberia. Ptolemy places the Stone Tower, even though he has professed to a 2280 stadia or 76 Schena reduction in the distance, at 135 degrees from the Fortunate Islands. This is a 2 ½ degree shift east when the calculated distance should be 5.7 degrees and a longitude of c132E. Ptolemy has stated this fact should be applied to his work and ignored it. That is unless he has merely reduced the route distance and applied a nominal longitude, which just happens to be 2 ½ degrees less in length than that of Marinus. 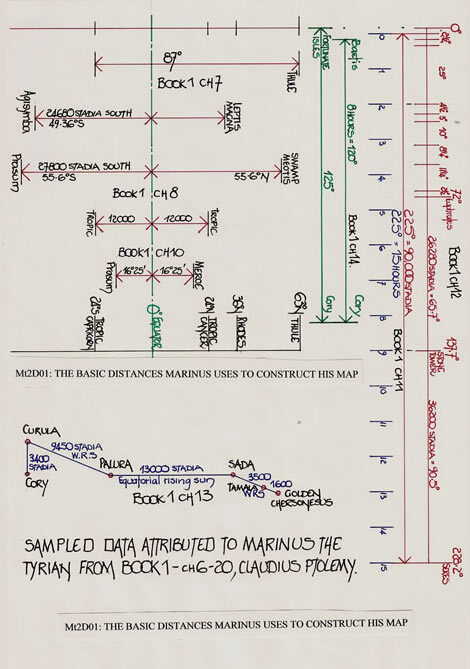 The diagrams accompanying the text have both the Marinus and Ptolemy maps thereon, with an overlay to illustrate the apparent coincident points which perhaps show that Ptolemy in adjusting India he was at all times using the map of Marinus and had to return to that base for continuity as he had not in fact carried out the original work, nor was he sufficiently able to totally ignore it and compose a totally separate map. Ptolemy distinguishes between Serica and Sinae, the land of Silk and China! We are given many place positions and descriptions of northern Asia, east of the Stone Tower, with a particular reference for Sera Metropolis, 1770 15’E and 38035’N. This is precisely the Smyrna parallel and thus the latitude given by Marinus in the Mediterranean Sea which Ptolemy has wholly accepted. But which Sera is it? Can we assume that the original positions given by Marinus have been altered by Ptolemy? He mentions them previously but is non specific as appendix one illustrates. Ptolemy in chapter 12 states he will reduce the distance from the Stone Tower to Sera and gives the distance as 18100 stadia/45 ¼ degrees. The Stone Tower he locates he locates at 135E/43N and Sera at 1770 15’E/38035’N. Thus we have, 135 + 45 ¼ = 1800 15’E, or some 3 degrees more than he has stated. This therefore is Ptolemy’s capital for Serica and not the capital of Sinaes or the Seres. Marinus places the capital of Sera on the Byzantium parallel at a calculated distance east of 228.2 degrees i.e. 72+65.7+90.5=228.2 degrees. However in text Mt1 it is shown that in all probability given the 225 degree/15 hour longitude quoted that was the distance measure used by Marinus from the Sacred Promontory of Iberia it is thus probably a total of 227.5 degrees from the Fortunate Islands. From Ptolemy we read, Sera Metropolis at 177015’E/380 35’N to Thyne Metropolis at 180E/3S, which is a shift in position of 41035’S and 20 45’E or c21000 stadia direct measurement. From Sera Metropolis by Ptolemy, 1770 15’E/38035’N to the Sera of Marinus at 228.2E/43N we have the same distance measure of c21000 stadia. And thus by equating Thyne Metropolis of Ptolemy to Sera Metropolis of Marinus, we find that they are on a 5:4 ratio angular disposition and can only have been adjusted by Ptolemy using the original map of Marinus the Tyrian to produce the geometry required to achieve the layout. The diagrams indicate that 5:4 movement NE/SW and the equi-distant measurements. 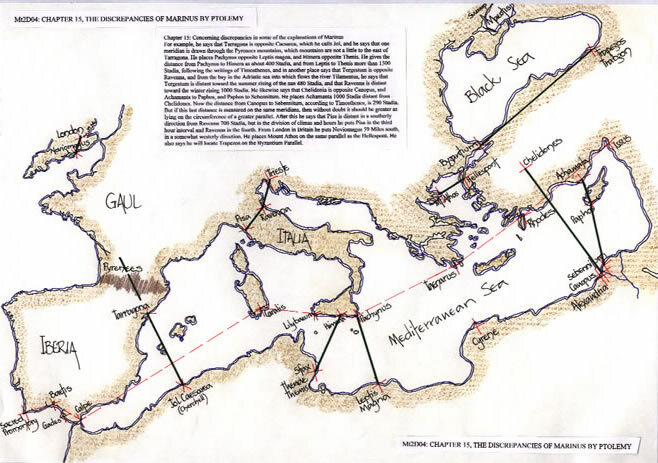 Claudius Ptolemy has taken the overall distance given by Marinus the Tyrian in his Geographical Books and as shown on his map, determined for unknown reasons that the oikoumene can only be 180 degrees in length and had to make adjustments to suit. It appears he has noted that Sera Metropolis is situated close to his desired limit for the oikoumene, 1770 15’/1800 and, not having carried out the research accepted the oikoumene of Marinus. Thus in positioning of “The Capital of the SERES” he has merely used the difference between the two as a radius and projected the whole of “China”, its capital Xi’an/Sera in a southerly direction until it was within the confines of the 180 degree limit he had arbitrarily set. This of course produces the 5:4 ratio which is the graticule ratio of Marinus. Therefore he has corrupted what was a plausible map produced by Marinus and no doubt would have been celebrated far more than the map of Ptolemy with its peculiar eastern extremity. Thus we can evaluate Cattigara, which was shown to be Canton in text Cp3, as well as Labadius Island, shown to be Hainan and position them as Marinus would have drawn. 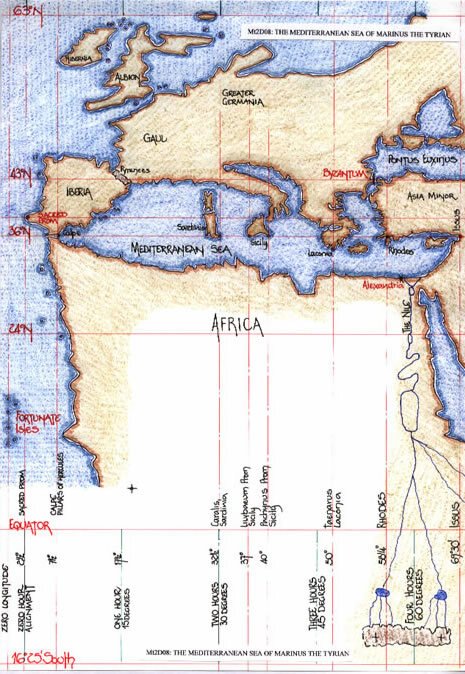 It is a reasonably easy task to draw the map of Marinus given that Ptolemy has been shown to accept virtually all of his Geography and thus the positioning of each Poleis and coastal locator. 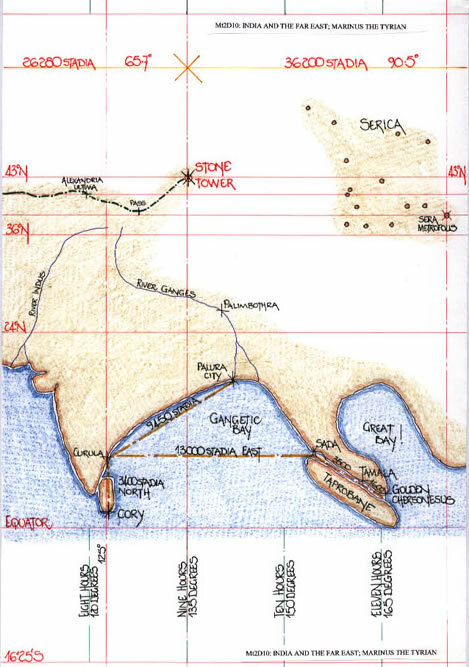 Using a graticule of 500 stadia latitude and 400 stadia longitude each point given by Ptolemy has been drawn where it corresponds to the Marinus original. That is I have ignored the alterations made by Ptolemy and inserted the original distance measures given by Marinus. I have had to forego extending Africa as there is just to little information available in Ptolemy’s text. For comparison between that which Marinus states and Ptolemy’s ideas I have produced overlays of the two maps, as Mt2D12 and Mt2D13. 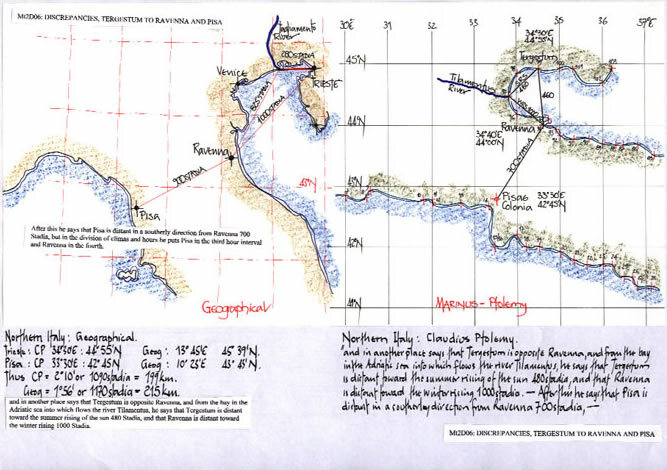 There is a considerable coincidence between certain map points when this is done and it indicates the original of Marinus being continuously utilised by Ptolemy to make the alterations he considers necessary. The map has been produced as a whole unit and also as a set of sections which overlap to enable it to be read at a larger scale. They are Mt2D08, Mt2D09, Mt2D10 and Mt2D11 inclusive. The overall map is a digital photo of the original (see Mt2P1, Mt2P2 and Mt2P3), and has been produced at two scales in order to facilitate easier reading. 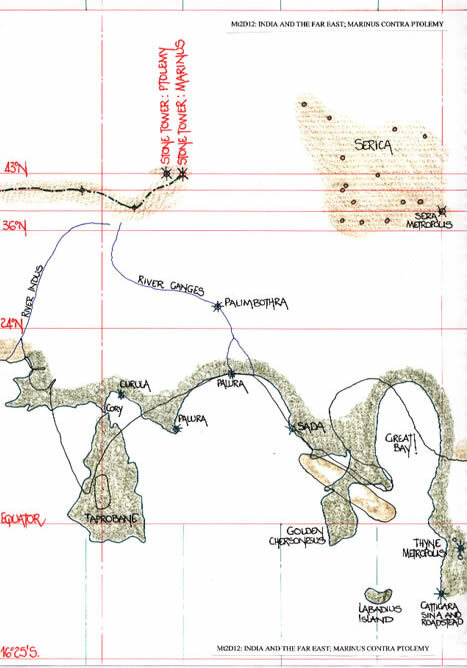 The sectional maps are drawn at A3 and scan copied as usual. 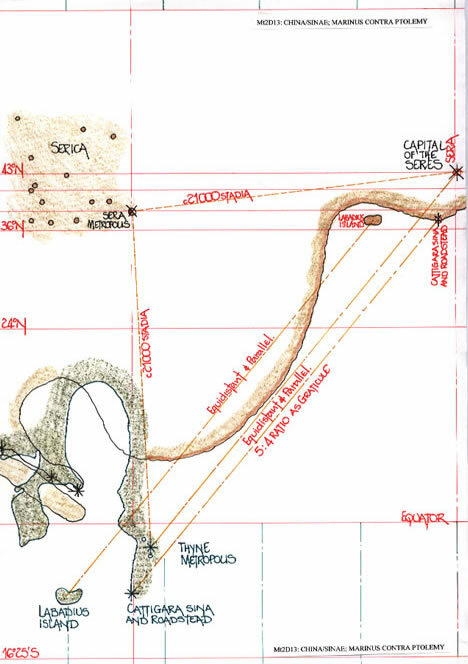 They are in fact the same map drawn twice with greater overlaps to enable the text to be followed section by section. 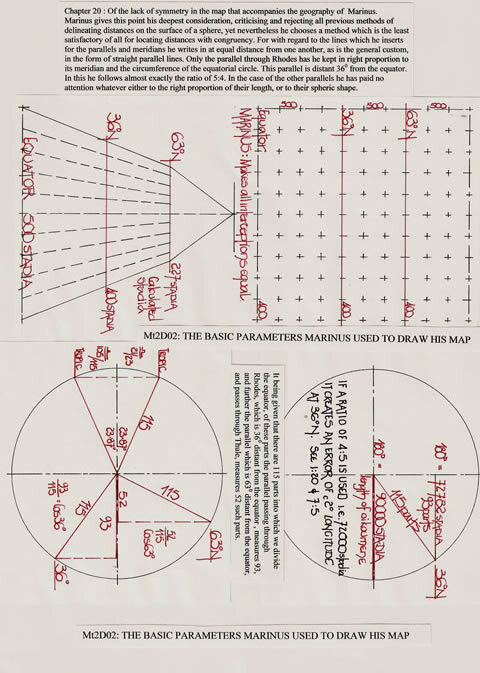 From the overall map it can be seen that if it had been drawn to a slightly larger scale, the ease with which the latitudes and longitudes could be read off to enable a new map or maps to be drawn on a varying projection is a simple task. My map is drawn using 5mm for latitude and 4mm for longitude which for those interested you can utilize a 1:200 and 1:250 scale rule to read off the degrees. Ptolemy intends to be quite open and honest in his critique of the work by Marinus the Tyrian. That is the impression given by the statements he makes in Book One. But, when the criticisms are analysed and the actual work by Ptolemy researched it is evident that he intended to do no more than completely copy and plagiarise Marinus’ work. The evidence for that is the complete lack of a carry through when he has criticised Marinus for one reason or another. It is as though he has forgotten all that he had written. But in inventing a new capital for “China”, Thyne Metropolis, and placing it at the geometric distance obtained from the location by Marinus of “The capital of the Seres”, surely is a step to far even for a plagiarist. But let me be quite clear concerning the work of Claudius Ptolemy. His Almagest, Tetrabiblos and Geography are fantastic works of astronomical and geographical thought. The tabulation of places and poleis by latitude and longitude was probably the most sensible act of the second century of our era apropos cartography. The projections for his maps have been used since then and will continue to be used. Thus he is rightly celebrated, but we must not exclude the original author. To our dismay we know so little about Marinus the Tyrian, but that should not stop us placing him before Ptolemy as a first class geographer. Without Marinus there would be no Ptolemy! That the whole of the eight books are based upon the work of Marinus, even though he did not tabulate the latitudes and longitudes, he provided the base map or maps from which those same co-ordinates were taken. Perhaps it is time to consider where practical to replacing Ptolemy with MARINUS. For ease of reference I am using the text by Stevenson, and thus his page numbers, starting with Book 1. -The extreme eastern region of the world known to us is defined by the meridian passing through the Metropolis of Sinae, which meridian is distant from that drawn through Alexandria measured to eastward on the equator 119 ½ degrees, that is about 8 hours. There are four papers explaining the Geography of Claudius Ptolemy by this author. The first is entitled: Claudius Ptolemy: Falsification, Regimentation or Symmetry? The map of Britannia examined and the turning of Scotland resolved. The third, (this paper being the second,) is entitled, India intra et extra Gangem + Sinae and Taprobane. The maps of Claudius Ptolemy explained with the resolution of place-names including Cattigara Sina. The fourth is entitled; The Text of Marinus the Tyrian and Claudius Ptolemy, Geographia: Book 4, chapters 1, 6, 7 and 8. The west coast of Libya explored and the zero longitude determined. They are texts, Cp1, Cp2, Cp3, and Cp4. 7] Ifrah, G. (1994-1998) “The Universal History of Numbers”, The Harvill Press London. Chapter 16, pp182-185. Several conversion scales were in use for high-sea navigation, mainly; 700 stadia per solar day, 1000 stadia per 24 hour day, 500 stadia per solar day. Distances taken along the coast were much more accurate (down to a one-stadion interval!) and segmented, but seem to belong to a far larger panel of scale-systems. In Section 3, Le probleme de la valeur du stade, is discussed. Ferrar, M J. (2007) ‘With Michael from Italy to Ireland’, published on www.journalofmaps.com It is available for selection now and on this site as StM1 text.